That serene pool of celadon-hued soup, marred only by the fussy addition of julienned celery leaves, looks so unassuming, doesn't it? And yet. While we were spooning it up last night, Ben pointed towards the bowl with his soup spoon (he was on the phone) and made one of the more protracted oh-my-god-this-is-the-most-delicious-thing-ever faces I'd ever seen from him, and then proceeded to silently mouth happily sated words to me in between bites of soup and telephone catch-up with a long-lost friend (yeah, we don't always sit around talking on the phone with other people when we're having dinner with each other, but in this case I had to make an exception... Jeff Levering!). I have to say, I was pleasantly surprised by how good the soup was. 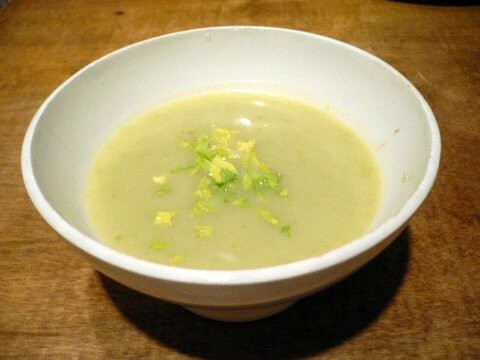 The recipe came from Leslie Brenner's piece in the LA Times a few weeks ago about the hidden wonders of celery, and was nothing more than a pot of sauteed onion, chicken broth, cubed potato and a whole mess of diced celery simmered until tender, then pureed and strained. On paper, it certainly didn't sound like much. I used an immersion blender which didn't work as well as blitzing the soup in a blender or food processor. When I attempted to strain the soup with a fine-mesh strainer I was left with a pot of watery liquid and a strainer full of mush. So I dumped everything back into the big pot, and used a large-holed colander to hold back the chunks of vegetable that hadn't made it through the blender. I added one tablespoon of cream to swirl prettily into the soup, but had to add no salt or pepper - it was nicely seasoned from the broth already. The result was a light and delicately-flavored soup that made the perfect appetizer for our hearty Sunday meal. The feathery celery leaves sprinkled on top of the soup were nice to look at, but kind of got in the way as we ate, so I'd leave them off next time. I always thought celery was sort of ugly duckling of stock vegetables: unless the stalks were filled with peanut butter, or diced to saute with onions and carrots, I didn't have a whole lot of interest in them. But this chic little soup changed my mind. Plus, don't you think the color's just divine? I bet Martha has a boudoir in one of her many houses painted that color. Or maybe a guest bathroom. Or a kitchen, with matching appliances? 1. Melt the butter in a soup pot. Add the onions and cook over medium heat until translucent, about 7 or 8 minutes. 2. Add the potato, celery and chicken stock or broth. Bring to a boil, then reduce the heat and simmer until the potatoes and celery are very tender, about 20 minutes. 3. Purée in a food processor or blender (you'll need to do this in two or three batches), then pass the soup through a medium sieve, pressing the solids with the back of a wooden spoon. 4. Pour into a clean pot, add the salt and pepper to taste, then stir in the cream, if desired. The soup may be kept warm on low heat until ready to serve. 5. Cut the celery leaves into chiffonade and garnish the soup before serving.